We love our family dances! These family events have become a huge hit in the community and we encourage people of all ages to join us. 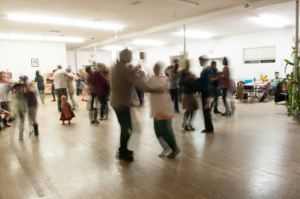 You do not need to know anything about dancing: the dance caller’s job is to teach all the steps to you and then lead you through each dance (with live fiddlers, no less!). Our dances are joyful, inclusive, entertaining, and just plain fun. Look at our calendar to see when the next dance is happening. Is this a Contra Dance? It’s quite difficult to describe exactly what these events look like, but we can tell you what they are NOT. These events are not serious Contra Dances with complex steps. 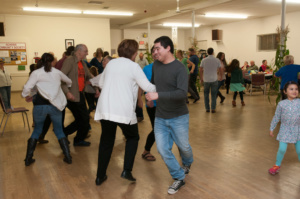 That being said, our dance caller, Trish Horrocks, is eager to cultivate the contra dance culture in Nanaimo. Trish will be calling contra dances in the back half of the evening. 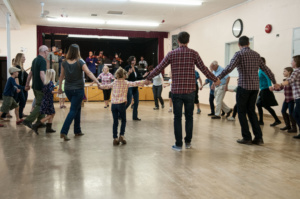 Her goal is to teach people how to contra dance, as well as hone her skills as a contra dance caller. Trish called her first Contra dance in September and it was very well received. These events do not involve line dancing. No “Achey Break-y Heart” will be heard at our dances. Our caller includes longways dances based on the Virginia Reel (think “do-si-do” and “swing your partner”), square dances, pattern dances (Schottische, Heel-Toe Polka, Waltz, Foxtrot), children’s dances (Sasha, Zaporozech), and dances from a wide variety of global traditions including Canadian Prairie dances and Middle Eastern celebratory dances. Do you want to host a family dance? If your local organization is looking for a way to connect with the community and/or fundraise for a special cause, we can help. The Nanaimo Fiddle Society has co-hosted dances with several local school PACs and other community organizations. In exchange for a donation to our bursary fund, the NFS will supply the live music and the dance caller. The hosting organization is responsible for supplying a suitable sound system for these events. Please send us a note if you are interested in hosting a fundraising dance.